03/20/2018 – c't is the leading computer magazine in Germany and for many years has been known for its critical, in-depth and extensive tests. Recently, the editors have taken a close look at network storage devices in the price range of 90 to 150 Euro and the attractively priced Thecus N2350, released last year, was not about to miss this comparison. 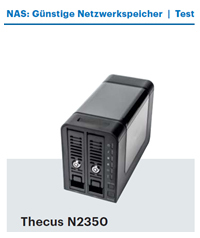 The Thecus N2350 is based on a dual-core processor and comes with 1 GB of DDR4 memory and the current ThecusOS 7.0 operating system which offers the opportunity through the integrated App Center to extend the functionality of this NAS with additional features such as cloud backups. "We were able to install more sophisticated services such as Twonky or Plex on [...] Thecus via the package management. [...] We could install extensions with just a few clicks and without logging in. Thecus package management is just as easy." In addition, c't emphasizes the use of the NAS as a 24/7 storage and therefore the need to inform users automatically about any potential problems. "This is handled accordingly by the models of Thecus [and a few others]." Finally, the N2350 came off well in terms of performance and network transfer according to c't. "It can score points with high performance - the menus load fast, read and write rates almost reach the maximum possible, and experienced users will also enjoy very detailed logging settings." Thanks to Andrijan Möcker and the team at c't for this detailed review.